Bluetooth, Heated Seats, Remote Keyless Entry, Aluminum Wheels, SiriusXM! On sale now! This vehicle was originally listed at $23490. We've marked it down to $22490. You save $1000. Offering a spacious interior that adapts to your needs the 2017 Sorento adapts to any lifestyle. 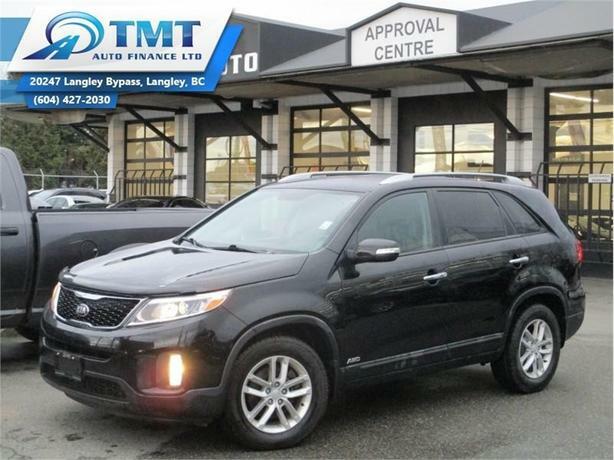 This 2017 Kia Sorento is for sale today in Langley. The 2017 Sorento has been redesigned with a wider stance and a longer wheelbase to provide a more versatile cabin. The Sorento has elegantly sculpted surfaces, more cabin space, and a wraparound dashboard for distinctive appeal. From finely crafted seating to intuitive advanced technologies, it's the car you drive to seek out adventure.This SUV has 70305 kms. It's white in colour. It has a 6 speed auto transmission and is powered by a 185HP 2.4L 4 Cylinder Engine. This vehicle has been upgraded with the following features: Bluetooth, Heated Seats, Remote Keyless Entry, Aluminum Wheels, Siriusxm, Steering Wheel Audio Control. It has some remaining factory warranty for added peace of mind. Our Sorento's trim level is LX. The LX trim gives this versatile Kia Sorento an excellent value. It comes standard with an AM/FM CD player with SiriusXM, an aux jack, and a USB port, Bluetooth phone connectivity, heated front seats, air conditioning, steering wheel audio and cruise control, power windows, power door locks with remote keyless entry, aluminum wheels, and more. Buy this vehicle now for the lowest bi-weekly payment of $146.52 with $0 down for 84 months @ 4.99% APR O.A.C. ( Plus applicable taxes - Plus applicable fees ). See dealer for details.